Come join me and TownePlace Suites by Marriott for their upcoming, brand new partnership with ? that will be announced at Windy City Smokeout. 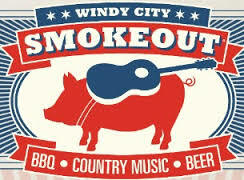 To celebrate the new partnership, and kick off the Windy City Smokeout weekend, TownePlace Suites is hosting a celebrity BBQ battle with country music trio Sister C vs. musicians Jordan Gray & Joey Hyde. The exclusive event takes place Friday, July 15 at 1:15pm. I am so glad to find this information.